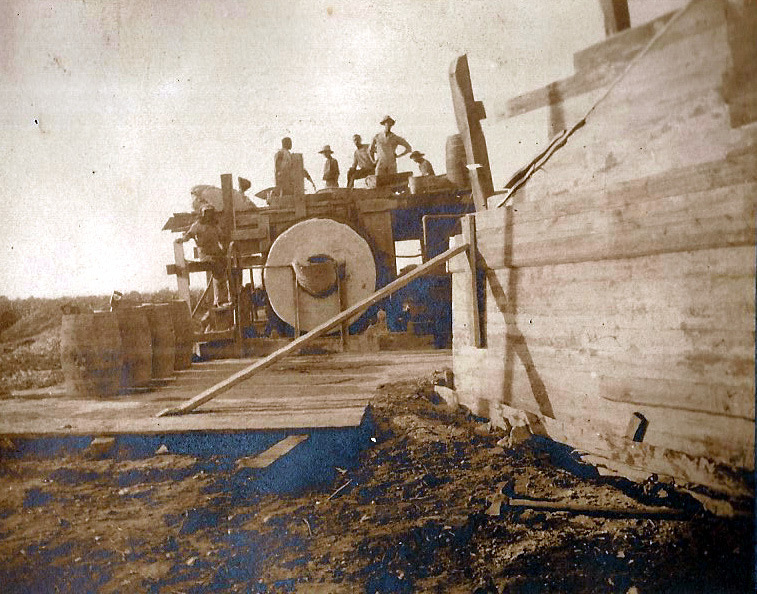 While working as a surveyor on the Long Island Motor Parkway in 1908 and 1909, Clinton A. Robertson (above) documented the Motor Parkway construction and his fellow workers with his trusty camera. 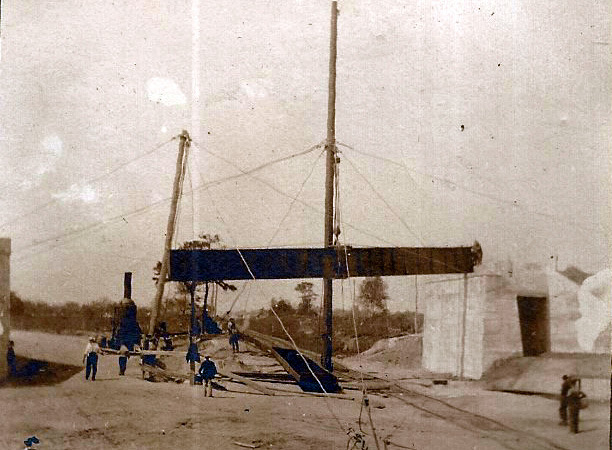 Lost for 109 years, Robertson's photo scrapbook with 84 amazing images of the Motor Parkway was recently purchased for $20 in a New Jersey flea market. These never-before published photos will be featured exclusively on VanderbiltCupRaces.com over the next several months. Some examples of this important discovery are below. 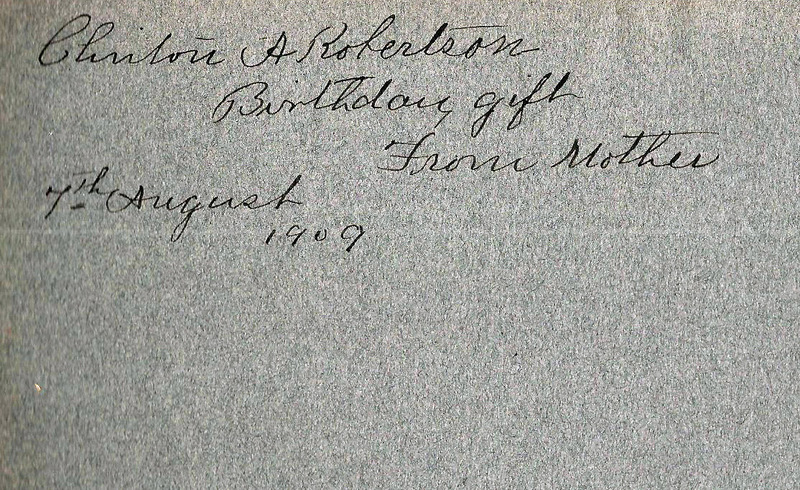 The scrapbook was a gift to Clinton A. Robertson by his mother on August 7, 1909. 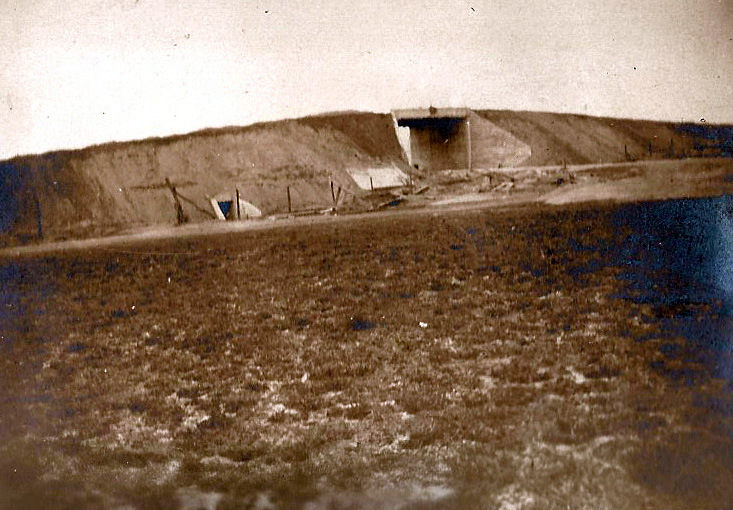 The 84 photos from 1908 and 1909 were captioned by Clinton Robertson. M.S. Reeves, a Motor Parkway engineer. L.W. Burgess, Clinton's fellow surveyor. 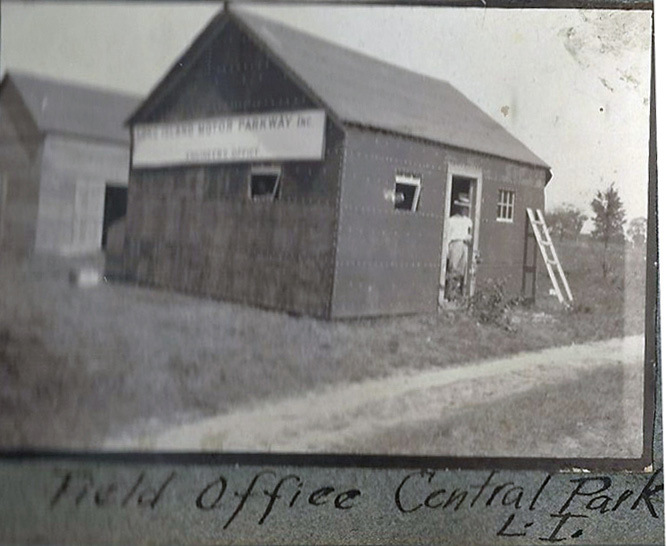 The Motor Parkway field office in Central Park (Bethpage). 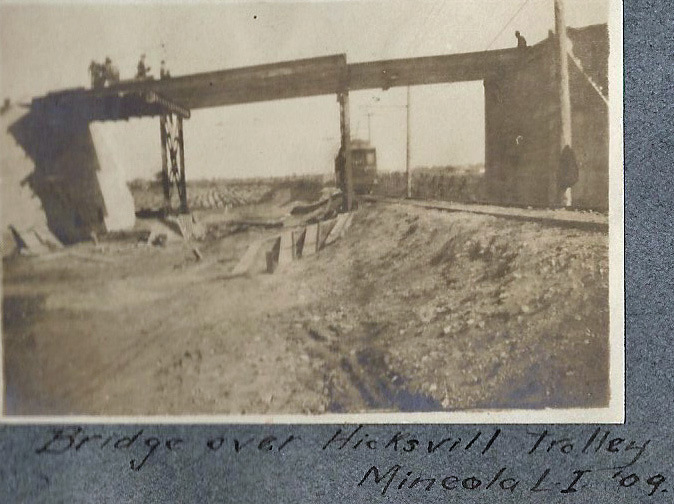 A Hicksville trolley approaching the Westbury Avenue Bridge in Mineola/Carle Place. 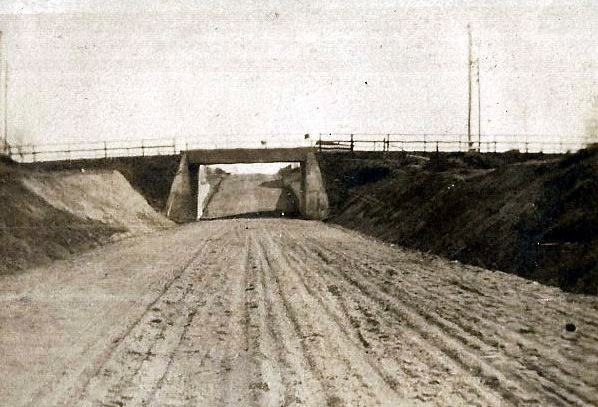 The Old Country Road Motor Parkway Bridge looking south to Garden City. 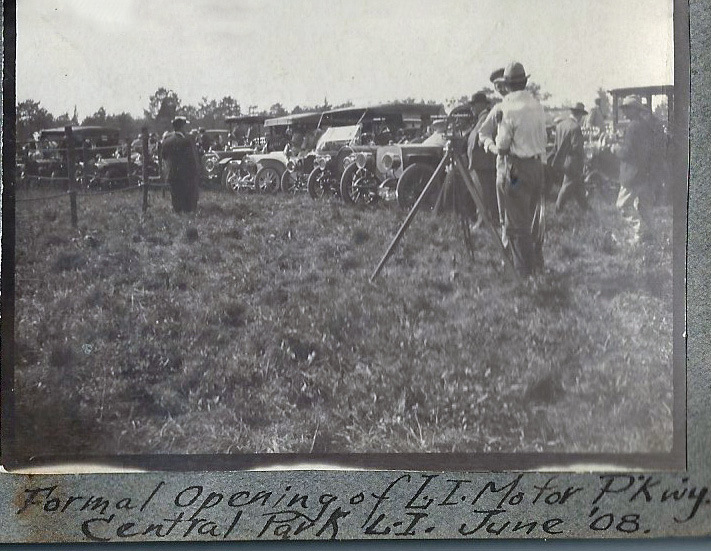 The Motor Parkway ground-breaking ceremony in Central Park (Bethpage) on June 6, 1908. 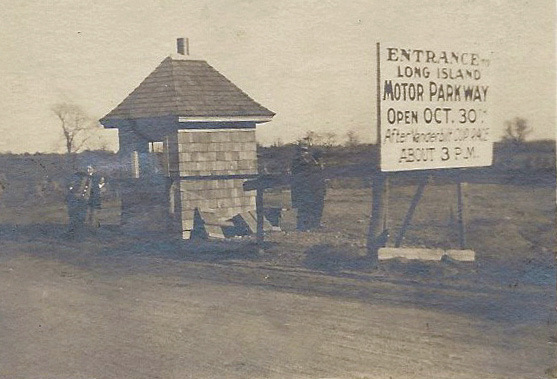 The Jericho Turnpike Lodge (kiosk) in October 1909. The gentleman on the right (also seen below) has the caption "Chief". 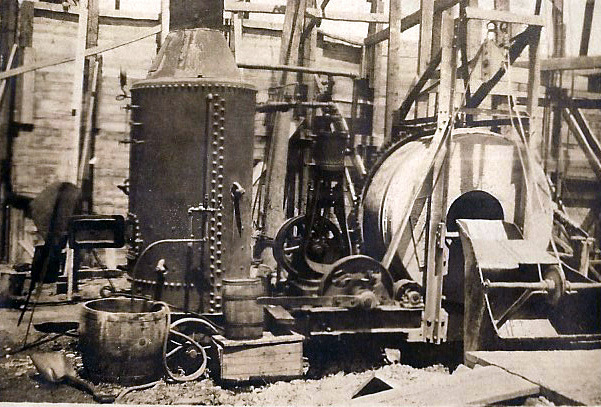 What a great treasure of historic pictures. Great photos, Howard. Probably some good mystery photos in the batch! And what a steal compared to another photo album on eBay just sold. It is the same album! Well spent $20.00, this is literally a goldmine! Long behold, the elusive Westbury Ave/Trolley Bridge! Definitely built for Auto and Trolley. Looking forward to future images. Thanks Howard! I wish I was the person who bought it for $20! My grandfather was a surveyor for the Motor Parkway. Please forward his name. He may be in one of the photos. Wow. Great pics. Love the old Long Island stuff. The payday pic made me laugh. 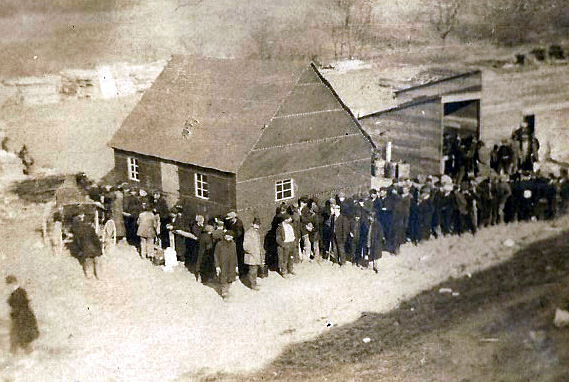 Imagine waiting on line for your paycheck like this?? So Art fill us in, someone bought this for $20 at a flea market and then sold it for how much?? W O W!!! Jackpot! Speechless and hypnotized. Please don’t disturb while entranced in these photos. Holy moly, many firsts here! I wonder if some dude named Kroplick bought this!?? It must have been one crazy dude! 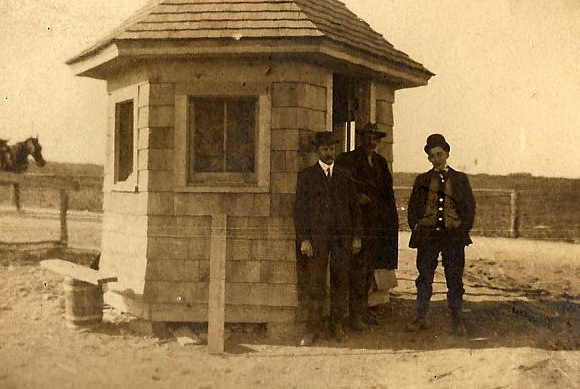 Amazing shot of Jericho Tpke, and the village of Mineola behind the “Chief” and crew at the kiosk. Fantastic find Howard! 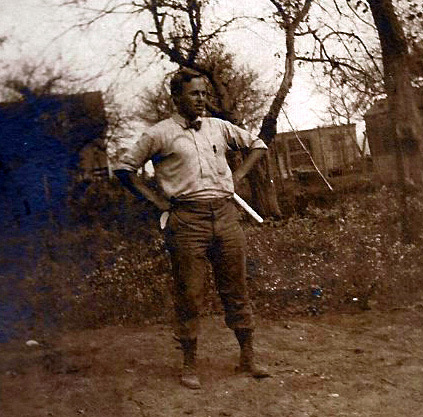 Surveyor Clinton Robertson is the hero of this batch of photos. He preserved the photos for some time before someone else continued the tradition. And here they are perfectly preserved after 109 years! I was once the “pole guy” recently, for a local surveyor here in Franklin Square (Clinton holding the pole in his right hand). 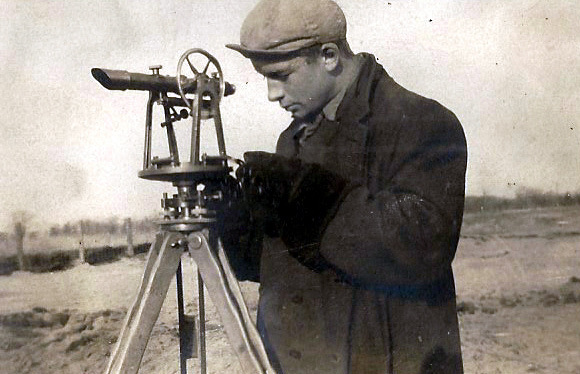 The technology today is more advanced using lasers with computers, but the concept is still the same using pole and main unit on tripod. I was praised at least three times by the surveyor for holding the pole so steady to 1/1000 of an inch accuracy. The computer actually notifies the surveyor! Thank you so much for sharing this with all of us, it is so fortunate that the album exists but just as fortunate that all of us have someone so generous to share this with us. I am not sure of the reason but some historians, collectors, researchers, authors are “hoarders” and bask in the glow that they know something or have something ( information, photographs, images) that no one else does, but they know would want to see. They refuse to share and just want to let people know “what I have and you don’t”. I have met and knowsome like that over my decades of research and writing and can just say that I have absolutely no respect for those people - what I really would like to say would not look good in print! History belongs to all of us, some are more interested then others. I guess it is the lifelong teacher in me that just enjoys sharing the knowledge with any and all. THANK YOU HOWARD for sharing this with us. A true treasure to see. Are there any details on the person who bought it for $20.00? Did he have a connection with this site? The lucky $20 person found the album in a New Jersey flea market. 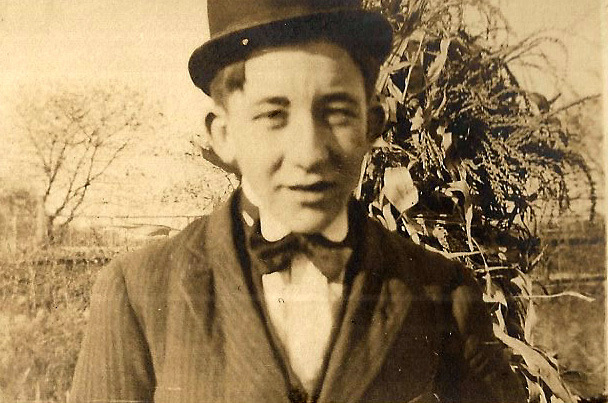 He is a collector of vintage photos and postcards. After visiting VanderbiltCupRaces.com, he realized the importance of the construction photos and placed the album on Ebay. Can’t get enough of these photos! Thank you Howard for displaying these. Looking beyond into the field at the Mineola kiosk with Chief and crew, the Mineola boundary ends in just 3 blocks from Jericho Tpke (850 feet). With no obstructions in the field, we are looking well into East Williston. Could that be the Hillside Ave Parkway bridge in the distance, over the Chief’s left shoulder? If so, that would be a distance of almost 1900 feet (0.4 miles). Howard, is it possible to zoom into those two mounds? Fantastic Fotos!